Wounded Warrior Project (WWP) and Johns Hopkins University recently hosted a health and wellness expo for a group of wounded veterans at the university's workout facilities. 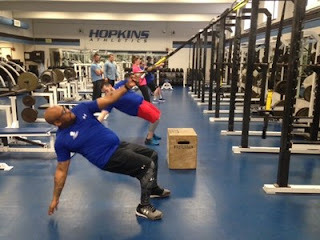 Warriors participated in a circuit of exercises focusing on different areas of the body at varying levels of intensity. Like other WWP fitness gatherings, the workout was in an environment that accommodated physical injuries and social anxieties. Depending on the needs and comfort levels of each warrior, WWP staff offered instructions on modifications that improved the workout. WWP frequently hosts a variety of on nutritional and fitness gatherings across the nation that aid in the physical and mental recovery from the invisible wounds of war. WWP offers programs and services that assist veterans with mental health, physical health and wellness, career and benefits counseling, and connecting with other warriors and their communities. To help support their efforts, Donate Now. Sunday I was the benefactor of a very kind donation for the Crossing America on Dirt ride to benefit Wounded Warrior Project. After several attempts to work with Seat Concepts, asking for their support to no avail, no return emails or telephone calls I decided to look for a seat to purchase. After riding 120 miles off-road on the KTM seat during the first test ride, my derrière motivated me to move the need for a better seat to the top of the priority list. To my surprise, on the local online classified ads, there was a listing for the exact seat I need. What luck, and it is brand new. After making arrangements with the seller to purchase the seat, we connected via telephone to workout the final details, since he lives in Idaho Falls, ID. During our conversation I shared my trek and the purpose for the ride. We had a great conversation and it was obvious we shared a passion for motorcycles. Minutes after we hung up, he sent me an email confirming the details of our conversation and told me to use the seat as his contribution for the Wounded Warrior Ride. WOW, that was completely unexpected, it is a GREAT and meaningful contribution to my ride. Giving back to those who have served our country is a passion of mine, and when someone helps me it is humbling. It is also a reminder of the good people in this country. I want to sincerely thank David C. for his generosity and support. Mid-February, every year, I get tired of winter. This year is no different, after the Utah-Nevada-Arizona-California ride I'm ready for riding season. This morning while working on the route I came across pictures of Engineer's Pass and Imogene Pass in Colorado. Both passes are part of my route. The pictures are 5 years old, mid-July, and a heavy snow year in the Rockies, very similar to this year. Crossing the Rockies will be fun! Right now the plan is kickstand up July 1st near Morehead City, NC and finish 4 weeks later at Battle Rock, OR. As the crow flies, it's 2,700 miles, on a motorcycle, off-road, I will ride 5,000 miles. Averaging 170 miles per day. Out of the 10-12 states I will ride, my home state of Utah will be the longest mileage at 1,000+ miles. My plan is to stop by my house and visit the family (sleep in my own bed). Due to the time of year (July, and high temperatures), I'm avoiding Nevada and going north, riding the southern edge of Idaho and possibly riding the entire state of Oregon. The only issue with Oregon is it is the only state on my route that doesn't honor my Second Amendment Right. If necessary I will ride further north through Idaho and finish on the coast of Washington. My plan is to tent camp 2-nights, hotel 1-night, then repeat the same rotation. Approximately 20 nights in a tent. This self-supported trip is not planned with a set schedule. Riding off-road is unpredictable, weather, navigation, breakdowns, fatigue, etc determine the number of miles traveled. This trip isn't about how many miles I can travel a day, it is about the journey, the cause (Wounded Warrior Project) and the great people I will meet along the way. riding in crashed. Mark's long and painful rehab process often made him want to give up. It was a Wounded Warrior Project event that helped him, realize that being in a wheelchair did not mean he had to place limits on his life. Another warrior amputee showed him that being disabled is not the end and inspired Mark to believe that anything is still possible. Mark credits the camaraderie he shared with other warriors with helping him take each day as it comes. 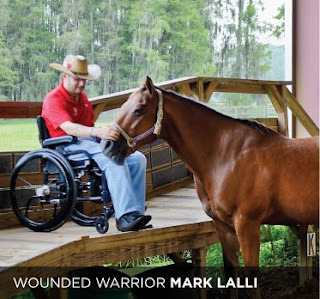 The support he received from the men and women of WWP motivated him to not just survive but to thrive. Donate Now and help support our wounded heroes like Mark. The Giant Loop gear arrived this week. My next test ride will include the Giant Loop tank bag, rear saddlebag and pull strap. For the 4-5 week trek, all of my gear/life will fit into those two bags and one stash bag. It's difficult to see in the photograph, but the Giant Loop bags are built tough with ballistic material to hold up to this type of back country adventure. 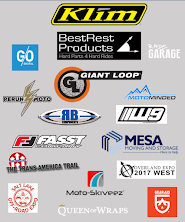 Thank you Howard and the Giant Loop Team for your support of the Crossing America On Dirt ride to support Wounded Warrior Project. BIG comfortable cruiser motorcycles, the first off-road test for the Steed was set. After grabbing essentials at the grocery store, I headed to the desert outside of St. George, UT in my trusted adventure van. Temperature was 70 degrees! In addition to safety, you need tools to handle the minor issues that result from riding a motorcycle off-road. Over a 4-5 week period I will go through several tubes, tires, break a chain, etc. I keep my tools in my backpack with my water. During the Crossing America trek, I will more than likely put the tools in the Giant Loop luggage. There is a natural anxiety when you modify your motorcycle, tearing it down, and building it back up. If things go wrong on the trail, you have no one but yourself to rely on This test ride was just that. The first hour was spent adjusting and tightening after short out-n-back rides. It was fun riding the BIG dirt bike on the trails and jumps. It is a big single cylinder dirtbike that is loads of fun to ride. The KTM 690 is nimble and it will do well on the 5,000 mile trek. The modifications are not done though, the test rides tests added parts but also raises new issues to resolve. This is the first test ride of many before the July 1st start. The Rade Garage auxiliary tank performed flawlessly. No leaks, no flow issues. The new air intake system provided from Rade Garage worked without a challenge. The 690 was not starved for air. This is the superior choice to add more fuel to the starved 690. The other options are bulky, and change the riding characteristics of the bike. The Rade Garage tank is stealth and keeps the bike looking stock. All 690 owners need to add this auxiliary tank. I did not measure fuel range on this ride. That will be saved for future rides when I'm packed down with supplies. The Warp9 wheels perform as good as they look. Hitting rocks, slicing through the tight trails and riding over the drop-offs didn't phase the wheel set. These wheels are going to take a beating and keep on rolling. The wheels make the bigger 690 feels like a 500 on the dirt. The wheels turn the 690 into a precision tool for carving up the dirt. GREAT addition to the Steed. Now if I could only ride as good as the wheels look and perform! Although I wasn't able to test the brake disc guards the bash plate (skid plate) did it's job a few times deflecting rocks and sliding down a couple high rock walls. One big surprise was the Garmin 680T GPS device. 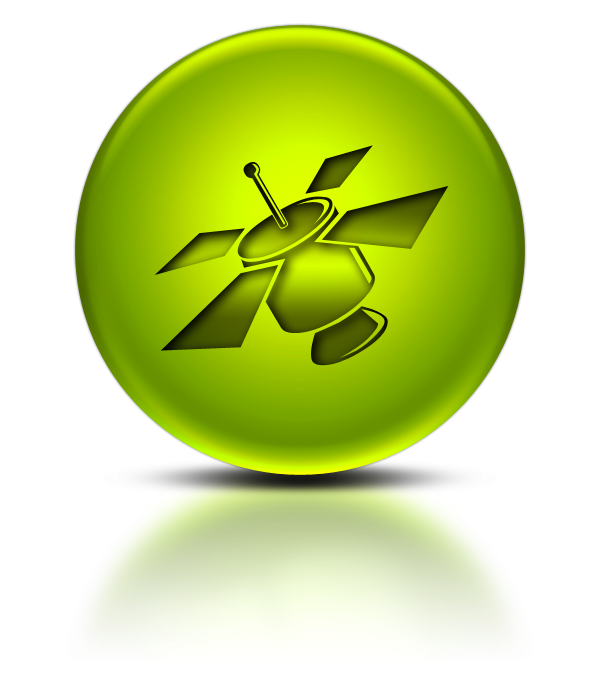 It is a great GPS device, fast, easier to use than the ZUMO, glove friendly and easy to mount. I purchased the 680 for a early winter Baja Mexico ride before braking my elbow/arm on a skateboard. The 680T will be my GPS for the 5,000 mile trek. The new exhaust looks great, performed great and sounds AWESOME. The video is at my home before the test ride, but its the first official engine start with the first round of mods. The MotoMinded headlights ROCK! The difference in light output is worth it's weight in gold. Unfortunately I couldn't get a good video of the light. I will use a better camera for the next test ride. If you ride off road, you need these lights. Even if you don't plan to ride at night, you will eventually ride at night rather you choose to our not. The install was super simple and they perform even better than I expected. After riding 120 miles off road the list of modifications continue. The OEM seat is a torture device and has to be replaced. The bars need to be raised approximately 2" for long stints of standing while riding. The vibration from the single cylinder engine is similar to a smaller dirt bike, but more intense. Within 25 miles of riding, my hands where numb. I'm hoping the Flexx Handlebar will dampen the vibration. The hand guards need to be swapped for a durable set that can withstand a good fall or tree hit. When flying down the dirt road that was freshly graded with new rocks (more like small boulders) and very soft dirt, the need for a steering stabilizer is high on the list. At 70 mph the feeling of floating on marbles is a little unnerving. The rear brake pedal pad is too small. The suspension felt harsh too, a good tune is in order. The first test ride was a HUGE success. Now it's back to the operating table to install the next phase of modifications. This week has been spent riding Harley Davidsons around Nevada, Arizona and California with my good friend from Michigan. What a great week to ride, the temp were cool in the morning and 60-70 in the afternoon. Most of our riding was on historical Route 66 with a stop at the iconic Roy's Cafe/Motel in Amboy, CA. After 1,100 miles of pavement it is time to put the off-road Steed to the test. There is a change in plans. Rather than ride the Mojave Trail, I've decided to drive closer to home and ride outside St George, UT. After the test rides, I can be home in 4 hours and spend more time with the family. The VISION of Wounded Warrior Project is to foster the most successful and well-adjusted generation of wounded service men and women in our nation's history. We can all help by giving even a small DONATION to help support those who served our country.